The universe consists of three basic things: dark energy, which drives the expansion of the cosmos; dark matter, which drives the formation and clumping of the galaxies, and regular (baryonic) matter. Dark energy and dark matter make up about 96% of the universe. Baryonic matter, the stuff of stars, planets, you and me, makes up only 4% of the universe. And most of that isn’t actually in stars and planets and us, but between the vast expanse of galaxies. It makes up the intergalactic medium (IGM) and it is notoriously difficult to observe. The reason the intergalactic medium is so difficult to observe is that it is both cold and diffuse. This means it doesn’t absorb much of the light that passes through it, and it doesn’t emit much light from radiant heat. This is not the same as dark matter, which doesn’t interact much with light no matter how dense it is. The matter of the IGM is regular matter, but it is particularly dim. It’s estimated that three quarters of regular matter in the universe is part of the IGM, with the vast majority of it consisting of diffuse hydrogen gas. Most of our understanding of this medium has come from the way it absorbs the light from distant objects such as quasars. Now two new papers published in the Astrophysical Journal present the first results of a detector known as the Cosmic Web Imager. 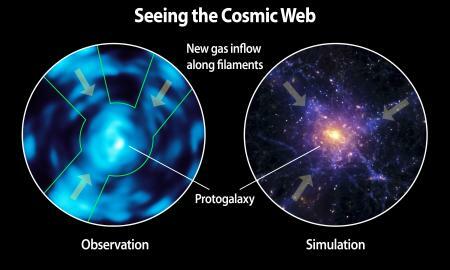 The Cosmic Web Imager gathers light at multiple wavelengths, focusing on a particular emission line of hydrogen known as the Lyman alpha line. In labs on Earth, the Lyman alpha line is at an ultraviolet wavelength, which is absorbed by the Earth’s atmosphere. But since the light of distant galaxies is redshifted, the Lyman alpha line is shifted into the visible spectrum, where it can be observed by ground based telescopes. Just how far it is shifted into the visible spectrum depends on how far away it is and how it moves relative to us. This is why the Cosmic Web Imager gathers data at a range of wavelengths. In the initial results presented in the papers, it is clear that the IGM forms filaments between galaxies and protogalaxies, and there is a flow of material between galaxies. Computational simulations of the IGM led us to theorize that such filaments were common between galaxies, but now we can start to observe these filaments directly.